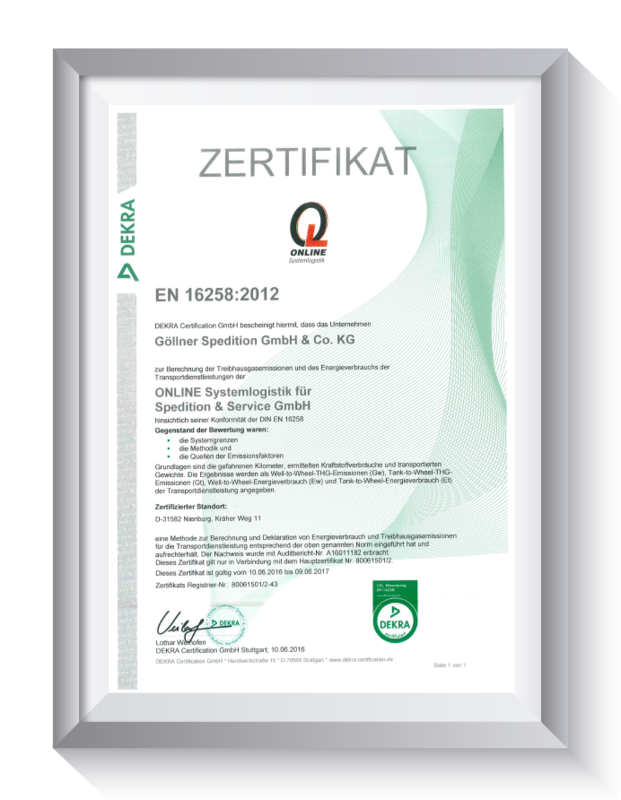 The Göllner group is committed to quality, sustainability and promotes the conservation of resources. For these reasons we have decided to become certified in a wide variety of areas. 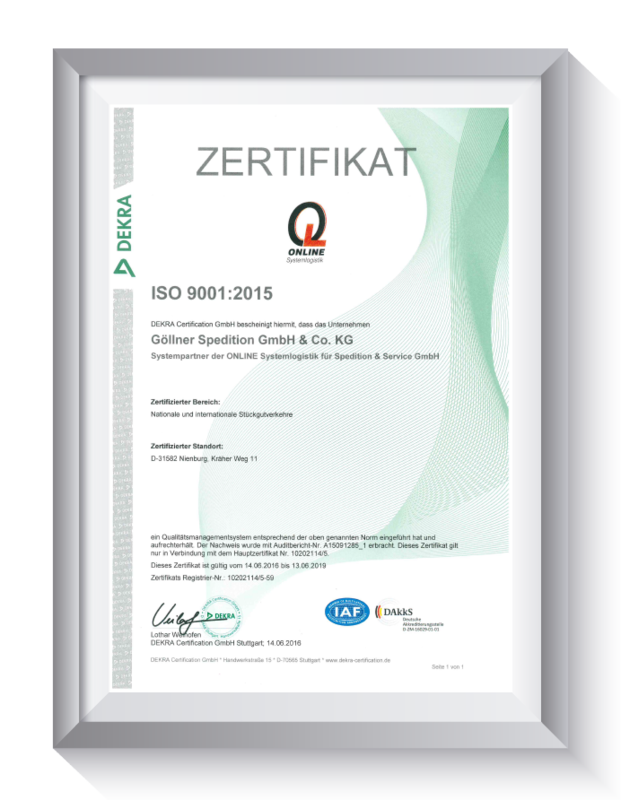 Thereby we have the ability to certify our quality through the verification of a third party, in order to instil confidence and give a sense of security to our customers. We have the opportunity, through these responsible actions, to minimise the risk of errors and reputational damage. And not just that: Certifications are proven to minimise costs through the efficient use of resources eg. time and knowledge. 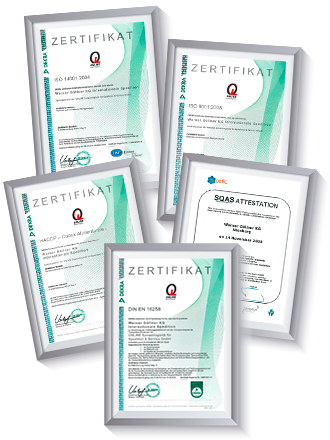 As an internationally active transport company we have the ability through the use of certification, to achieve the worldwide standards and comparisons in the era of globalisation. We would like to and must react to the wishes and demands of our customers and business partners. The demand for performance certification is continuously increasing, especially in the transport sector. According to a study carried out in 2009 by the “Institute for Marketing Research” 86 percent of customers would pay more for audited/verified services, processes and products. We would like to make our customer orientation, performance capabilities as well as our quality and security as transparent as possible for you. 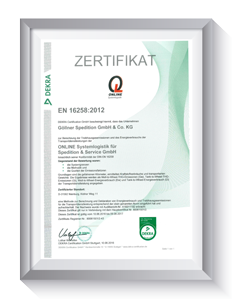 Below you have the ability to find, some of our most important certificates with a short description. ISO 14001:2015 specifies requirements for an environmental management system to enable an organization to develop and implement a policy and objectives which take into account legal requirements and other requirements to which the organization subscribes, and information about significant environmental aspects. It applies to those environmental aspects that the organization identifies as those which it can control and those which it can influence. It does not itself state specific environmental performance criteria. ISO 14001:2015 is applicable to any organization that wishes to establish, implement, maintain and improve an environmental management system, to assure itself of conformity with its stated environmental policy, and to demonstrate conformity with ISO 14001:2015. 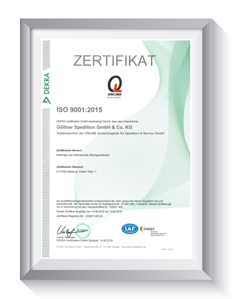 ISO 9001:2015 specifies requirements for a quality management system where an organization needs to – demonstrate its ability to consistently provide product that meets customer and applicable statutory and regulatory requirements and aims to enhance customer satisfaction through the effective application of the system, including processes for continual improvement of the system and the assurance of conformity to customer and applicable statutory and regulatory requirements. 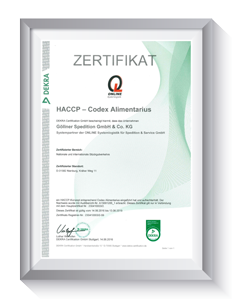 Hazard Analysis Critical Control Points (HACCP) inspections ensure optimum risk management for food and animal feed manufacturers and processors. 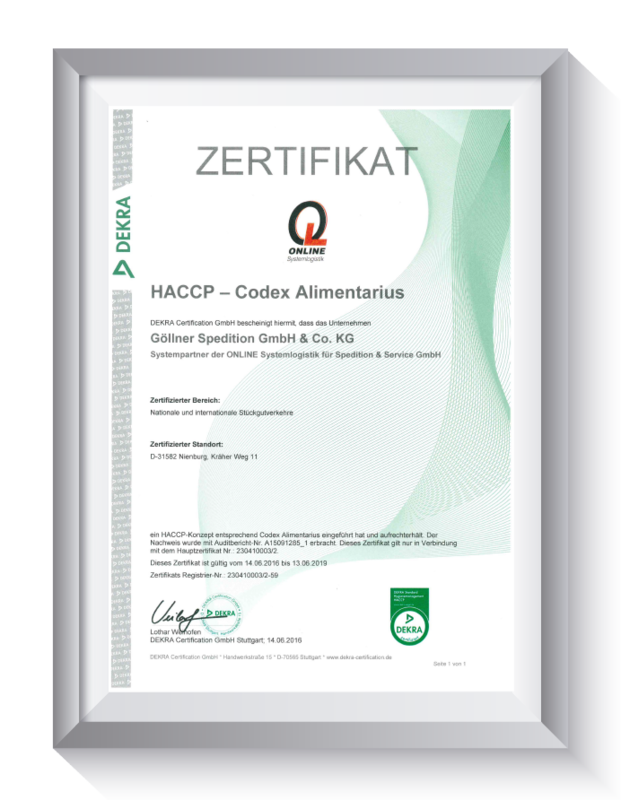 Based on the international guidelines established by the Codex Alimentarius Commission of the Food and Agricultural Organization (FAO), this approach takes a wide range of legal requirements into account. In addition to basic food hygiene requirements, the microbiological, physical and chemical hazards at each stage in the manufacturing process are identified and evaluated. These hazards can be minimised by identifying and checking critical control points (CCPs) in production and logistics. 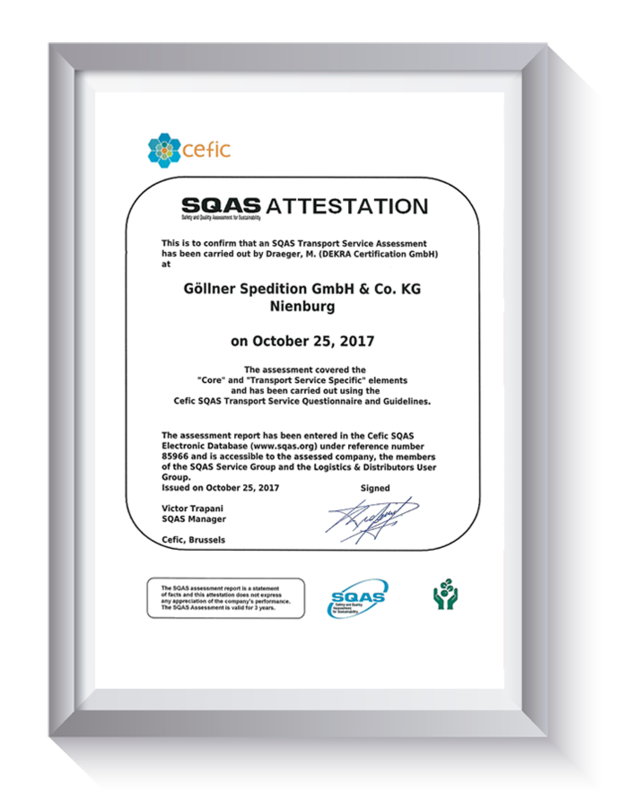 SQAS is a standardised assessment to evaluate the quality, safety, security and environmental performance of logistics service providers and chemical distributors centrally managed by Cefic. Assessments are carried out by independent assessors. 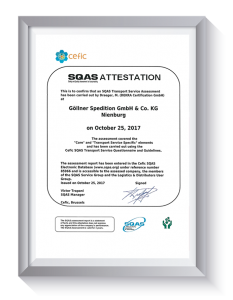 An SQAS assessment offers a detailed factual and objective report, which each chemical company needs to evaluate according to its own requirements. It shows the LSP the areas for improvement and offers a guideline towards these improvements. It does not lead to official certification. This European Standard establishes a common methodology (general rules) for the calculation and declaration of energy consumption and greenhouse gas (GHG) emissions related to any transport service. It applies for passenger and freight transport services, provided by, for example, LPT and railway companies. The standard contains: definitions, general principles, calculation methods and examples, as well as declaration specifications. It is based on a pragmatic and scientifically acceptable approach which allows application for a wide group of users. Potential users of this standard are any person or organisation who needs to refer to a standardized methodology when communicating the results of the quantification of energy consumption and GHG emissions related to a transport service, especially: – transport service operators (freight or passengers carriers), – transport service organisers (carriers subcontracting transport operations, freight forwarders and travel agencies), – transport service users (shippers and passengers). This European Standard has been prepared by CEN/TC 320/WG 10 with the collaboration of German experts. At DIN, Working Committee NA 159-01-13 AA “Energieverbrauch und Treibhausgasemissionen im Zusammenhang mit Transportdienstleistungen (Personen- und Güterverkehr)” (“Energy consumption and GHG emissions in relation to transport services”) at the Services Standards Committee (NADL) is responsible.